Both bbPress and phpBB are PHP based forum softwares. However, although their primary goals are both to aid in the formation of an online community and to easily allow your sites visitors to discuss topics with each other, the routes they both take to achieve that goal is quite different. The bbPress forum software is developed by the same group which created WordPress. It shares much of the same code base and so is often a favourite pick for those wanting to integrate their forum with a WordPress installation. However, unlike most other forum softwares such as phpBB, SMF, MyBB, PunBB etc., the bbPress forum project was designed from the very beginning to have as few features as possible. Although this may seem illogical in some ways as it means you get less features, it has many benefits, in particular due to the software theoretically being less buggy than it’s larger, bloated counterparts. Due to the tight nit code and developer base of bbPress and WordPress, it is trivial to ensure that the visitors to your forum will also be logged into your WordPress powered site at the same time. Instructions for doing this are available on bbPress.org. The logins for phpBB and WordPress can be integrated, however it is not as simple to setup as with bbPress. The search system built into bbPress is very crude. It has many of the same problems which afflict the built in WordPress search facility. However for small-scale forums this is often not a problem as there is little content to search through. For larger bbPress forums it may be best to make use of the Google search tool to allow the search facility to find the best possible results. phpBB has a far more sophisticated method of searching, including fine grained control such as over which forum is being searched. Like WordPress, bbPress has opted to use the Gravatar.com service to serve it’s avatars by default. The Bavatars plugin may be used to allow users to upload their own avatar directly to the forum. phpBB includes the ability for users to upload their own avatars but there does not appear to be a gravatar MOD for it. phpBB includes a sophisticated private messaging system by default. bbPress requires the bbPM plugin to add private messaging support however it is not as feature rich as the system built into phpBB. bbPress has very poor moderation abilities by default, however the addition of the bbPress moderation suite plugin can add sufficient moderation abilities for most purposes. phpBB includes an extensive moderation system by default. phpBB includes a system for adding attachments to posts, however there is no readily available plugin for bbPress which can add this functionality to the latest version. bbPress uses a similar php based templating sytem to the one used in WordPress. Most WordPress developers find bbPress very familiar and have no difficulties in working with it. phpBB uses a templating language and so can often be more difficult to add simple functional changes within the theme itself. Due to the huge array of extra features available in phpBB, their themes are far more complex accordingly. bbPress themes on the other hand are very simple due to it’s lack of features. Since phpBB is far more popular than bbPress, there is a much wider availability of themes for it. The bbPress Showcase has been discontinued. My code will remain on bbpress.org as open source GPL for those that wish to use it, however I caution you to consider bbPress’s lack of leadership before continuing to use it. _CK_’s plugins are still available in the bbPress plugin repository, but have not been updated for the latest versions of the software and are unlikely to be updated again. 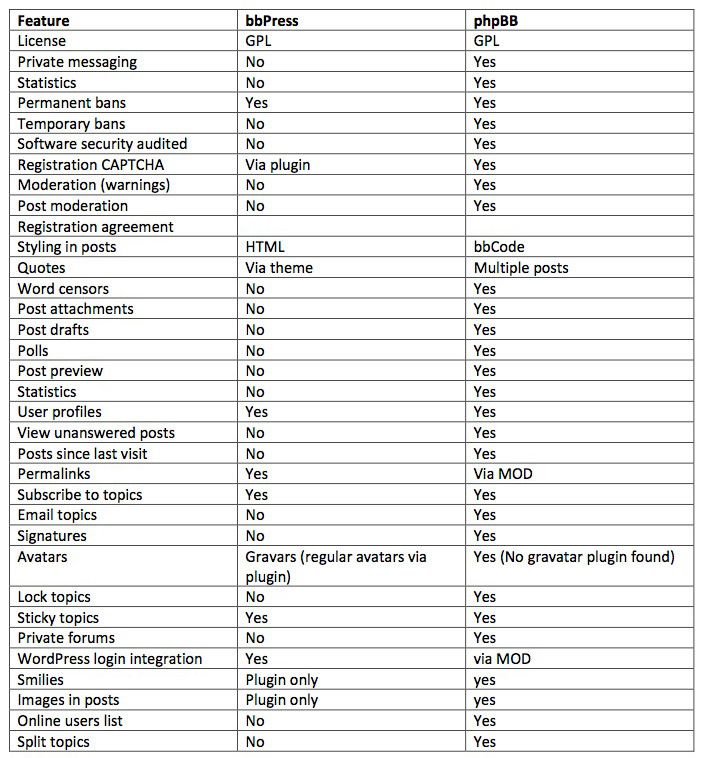 The phpBB MOD database has a very large array of well support MODs, despite phpBB having a large number of features already built in. Below is a non-exhaustive list of features available in both softwares. Plugins/MODs are only mentioned which are compatible with the latest version of the software. Where bbPress really shines is in the development of support forums, question forums or situations in which you are simply trying to illicit conversations from community members without trying to create a full-blown social networking hub. The basic functionality of posts, topics, forums and basic spam protection is built into bbPress straight out of the box. The primary advantages to using bbPress are the easy ability to integrate users with WordPress and the easy theming system. Where phpBB shines is in the development of social sites where users stay around long term, communicate with each other and create interpersonal relationships between each other. The addition of social features such as forum signatures and private messaging allow users to communicate with each other in a more personal way than with a simpler forum powered by bbPress. The primary advantages to using phpBB are the large number of features available by default, the large network of other users and information, the large number of mods and the large number of themes available. Neither software is better than the other, they are just different. I love how easy it is to install but it’s not pretty. Just download and turn it on and put a shortcode on the page you want the forum to appear in. That’s it – no dealing with databases or configurations or installations. It’s got tons of features but i don’t see any way to make it look good. i spent a couple hours removing and simplifiying mostly via CSS) and ended up with something that is just ok. Functional but messy. But it’s really fast so that’s an important feature too for small sites with low budgets that want a forum. What it needs is a better set of skins and less stuff in HTML tables. UPDATE 8/16/2011: BBPress is now a plugin. That means it should be much much simpler to deploy. I for one can’t wait to try it again. well done dude, that was a great comparison. Now, which should I go for phpBB or VBulletin? I’m looking to develop a big site, with a large number of members along with a wordpress blog. Thanks! I would need more information to give you advice. Hello, I had punbb and then bbpress, and I prefer much more the second choice! I have tried both of them bbPress and phpBB. Be honest, phpBB is much more complicated, I spent so much time with that mods. bbPress is more comprehensive and plain in management, it’s easy to install plugins and what’s more important this forum is integrated with wp cms platform. I mean you don’t have any connection bridge. I’m a bbPress beginner (I just moved my forum content from phpBB to bbPress with cms2cms service) but all the operation shades are pretty clear even if you just start using bbPress. Good job on the comparison! That is a nice table you have composed.